What we need to remember, lead is ubiquitous and is found in our soil, water, food, air, etc. So, it will never be completely removed from our lives as hard as we may try. So there is more to this story than just avoiding lipstick. Yes we can try to avoid lead whenever possible by making good choices, but we drink more allowable lead in our drinking water than what we would find in our cosmetics. Furthermore, lead which is found in soil is taken up by the plants we ingest (fruits and vegetables). It is simply a fact of nature. Unfortunately, many NGO's have taken to task an environmental issue and have propagated a convoluted theory in regard to our cosmetic industry. The problem with their supposition in regard to lipstick or any other cosmetic for that matter, is they try to extrapolate an environmental issue surrounding old constructed homes or our drinking water to somehow being able to cause this identical harm through skin penetration or miniscule amounts that may be licked off our lips. We realize that environmental activists would prefer "zero" levels in all things in order to remove lead from our lives completely, but this is something that will not happen. The EPA's Maximum Contaminant Level (MCL) for lead in drinking water of 0.015 mg/L, or 15 parts per billion, as the legally enforceable standard that applies to public water systems. In order to even begin to receive this allowable level of lead in our drinking water, it would require a person to ingest a gallon of lipstick per day. Based on these numbers alone, any concern for consumption of an inordinate amount of lead to be consumed in this manner, let alone absorbed, even if you live to be thousand, poses little risk of lead exposure through your favorite lipstick. 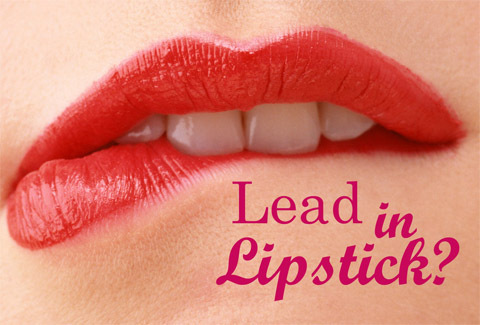 The FDA recently published the latest information and created an FAQ on testing the levels of lead found in more than 400 lipsticks, and chose those based on the market share they controlled, nationally. Since this would obviously reach a larger demographic of women, hence a higher exposure to the contaminant, supposedly. The FDA also used a private independent laboratory for their testing known as Frontier Global Sciences in Seattle, WA. In doing so this would protect the findings from the NGO's claiming "vested interest." There were some in the beauty industry fighting the claims of exposure limits through the analysis that lead found in lipstick at the ratios which fell well below that of candy were far safer and were at a lower risk since we eat candy and not our lipstick. The FDA of course does not support this claim and we agree that this is a poor analogy. The FDA recommended upper limit for lead in candy is 0.1 ppm. It is not scientifically valid to equate the risk to consumers presented by lead levels in candy, a product intended for ingestion with that associated with lead levels in lipstick, a product intended for topical use and MAYBE ingested in minute quantities than that of candy. Therefore, the risk is even further minimized. Also, it was important for the FDA to do updated testing to make sure things had either improved, got worse, or no change. No matter what some say about the inefficiency of the FDA, they strictly regulate all colorants used in food, drug, cosmetics and LIPSTICK. The Safety of Colorants is very important in this regard since many of them are also ingested via foodstuffs and not just used to make us look pretty. To be clear on this, lead is not added to lipstick, but is a natural contaminant that occurs from ingredients used in the making of lipsticks, particularly "red" lipstick due to certain colorants used. No one has ever denied that this contaminant can be found in most of the large commercial brands of lipsticks. The Campaign For Safe Cosmetics was claiming however, that lead is being added to lipstick by cosmetic manufacturers as though it was a "must have" ingredient to make lipstick, rather than it being a natural contaminant. Yet the fact remains that actual numbers of lead contamination are so small that looking to lipstick as the reason of what is killing us is beyond comprehension and without credibility. We will all consume far more lead in our lifetimes through the ingestion of foods, air pollution and our drinking water. In this context, lipstick shouldn't even be on our radar as a main cause for concern. True "Red" lipstick seems to have the highest level of lead found due to the colorants used (dyes and lakes), so if one is truly concerned, avoid this color altogether. There are many other beautiful colors besides RED lipstick. Also many ingredients used to formulate the large commercial brands have a higher incidence of lead. Where the concern lies according to the FDA, is with overseas manufacturing where there is no regulation for this contaminant and then is imported to the U.S. However, there are some U.S. manufacturers providing some products which contain a trace element of lead. Colin Sanders: Formulator of cosmetic and topical pharmaceuticals for 27 years. Active member of the Society of Cosmetic Scientists since 1985 and in 1999 organized the first of the Formulate shows. His degree is in environmental science and he continues to take a keen interest on the impact of human activities on the planet. "The lead is bound up in mineral particles making it hard for the body to absorb it. If you look at the test method the FDA were using they were extracting it using hydrofluoric acid. On top of that the particles are coated with wax. And the amount applied for all but the most dedicated lipstick lover is tiny. And only a fraction gets ingested anyway. And even then, the levels measured were below WHO (World Health Organization) guidelines for drinking water. I think it is safe to conclude that lipsticks are safe even with the levels of lead measured in the second study." Perry Romanowski: Over 18 years experience formulating products to solve consumer problems in the personal care and cosmetic industry. He is also an author who has published extensively about the field of cosmetic science. Perry received his B.S. in Chemistry from DePaul University. He has written and edited numerous articles and books, teaches Society of Cosmetic Chemists continuing education classes in cosmetic science. "The other thing neglected is that the amount of lead in lipstick would only matter if it were bio-available. I attended a talk by a scientist who was explaining what they had to do to analyze the amount of lead in lipstick. They needed to use the most potent acid available (HF) to dislodge the lead because HCl was not strong enough. This essentially means that even if the lead from lipstick gets in your body, there is no mechanism by which it would interact with your body metabolism." The key factor is the FDA found no health risk in the ppm amount measured and this is echoed by Health Canada as well. Despite the reports and the support of agencies having independent testing done, Campaign for Safe Cosmetics continues their running diatribe of disinformation and scare tactics directed toward women. Furthermore, the irony of CFSC arguing "just take the lead out", one must ask a very valid question of them. Since there are two compact signers listed on the FDA report as containing low levels of lead contaminant, why are they not conforming to CFSC standards themselves? Their campaign is riddled with hyperbole and hypocrisy, ignoring all the scientific data presented by other more respected organizations. This only shows an ongoing attempt to scare women consumers is designed to gain financial support based on nothing more than skewed numbers and pseudo science. What About Our Lip Gloss (liquid lipstick) Products? We of course always strive for an excellent, safe product in spite of all science, and our lab has certified the pigments used to be free from lead. Our colorants are provided by reputable suppliers that conform to FDA regulations in regard to colorants and ensure us the mineral pigments are free from heavy metals for the simple fact our colorants are synthetically created. Our lip pigments were also third party tested to verify they pass for safety, and are manufactured under GMP Guidelines. But one must also realize that many pigments today utilized by commercial brands may not necessarily create the lead issue either. Coal Tars were popular originally for creating dyes and lakes and these were heavily contaminated with lead. Most of today's manufactured colorants however, come from petroleum based formulations, whereby removing much of the concern. Other colorants favored are micas and iron oxides which is all we use to pigment our lip colors. Dyes and lakes must be used in commercially formulated lipsticks in order to get those vibrant, flamboyant colors. These are colorants we will continue to steer clear of and provide only beautiful, rich colors through the use of micas and iron oxides. Where some slight contamination can still occur, even with plants grown organically, is any lead bound in soil from where plant extracts are taken are then utilized in our lip colors. We wish to only use organic oils and butters with the least amount of processing. This is to keep them as true to their natural state so that you may enjoy the benefits they offer to your lips. So by today's standards as was explained above, removal of lead completely will be near impossible depending on synthetic or natural ingredients used, especially when there are allowable safe amounts designated by many health organizations, including WHO (World Health Organization). With this latest knowledge we hope you'll feel comfortable in using and enjoying your favorite lip color whether it is ours or some other brand... Or not, the choice is always yours!